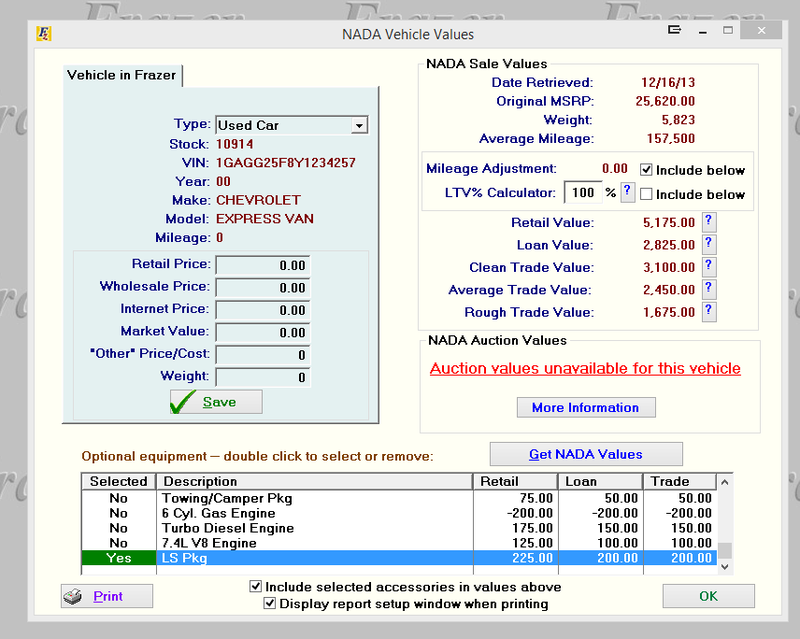 You can determine the value of both current and potential inventory vehicles using the Frazer NADA integration. However, this is one of a few services which requires an additional subscription fee in addition to your normal Frazer fee. In order to subscribe to this service and activate your NADA integration please call Frazer at (888) 963-5369. Once you have activated your integration it can be accessed through various points in your Frazer. 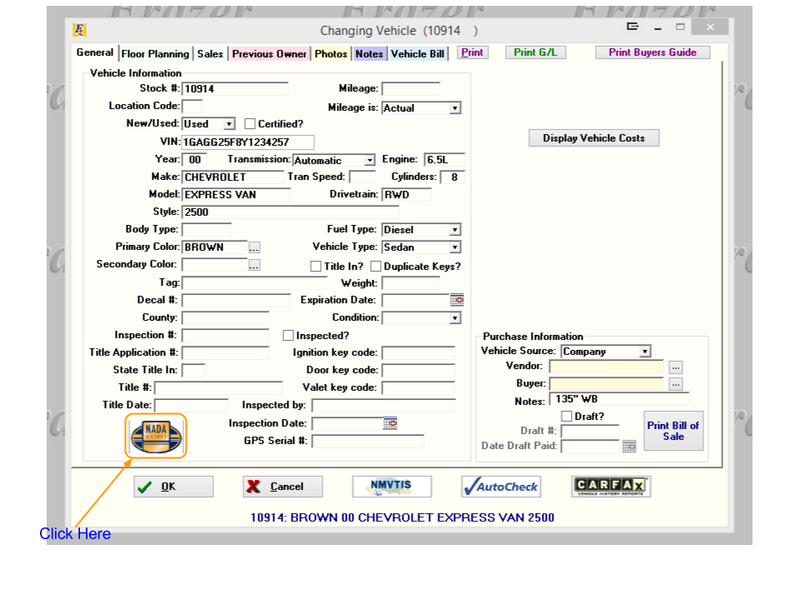 One of the easiest points is through the general tab of the vehicle file. Click on the NADA logo at the bottom left of the screen. 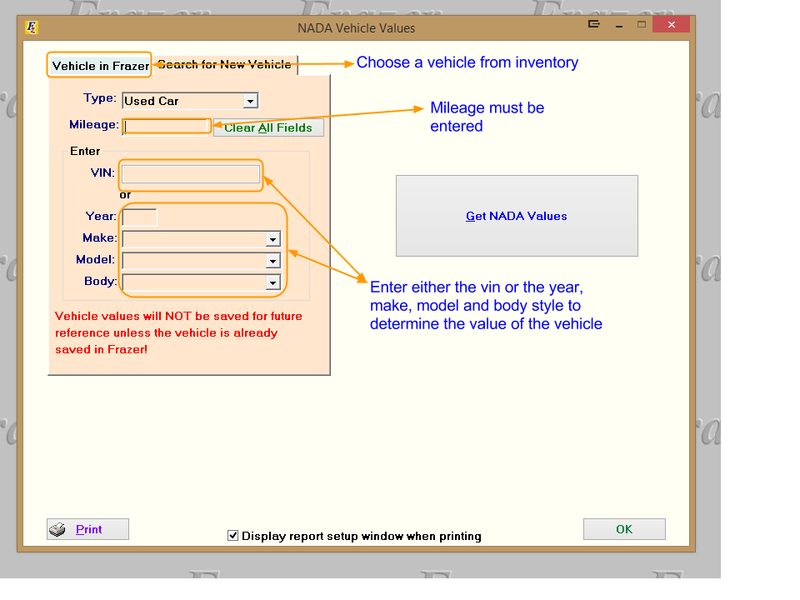 The NADA value screen should open and you should see the Frazer system connecting with NADA and populating all the appropriate values. 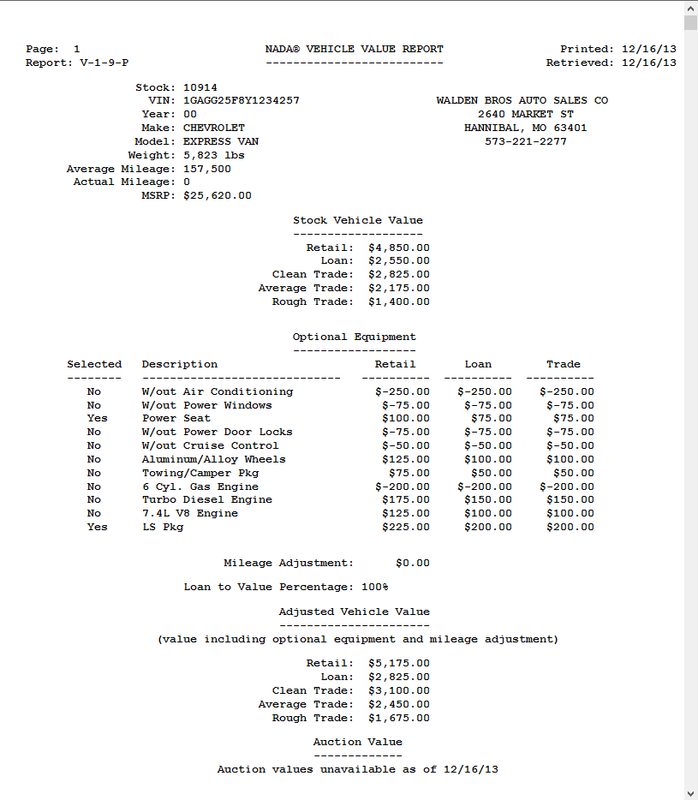 The top right of that screen supplies some of the general sales info for the vehicle you are looking at including the manufacturers suggested retail price, the listed weight of the vehicle, and the average miles for that vehicle type for that model year. 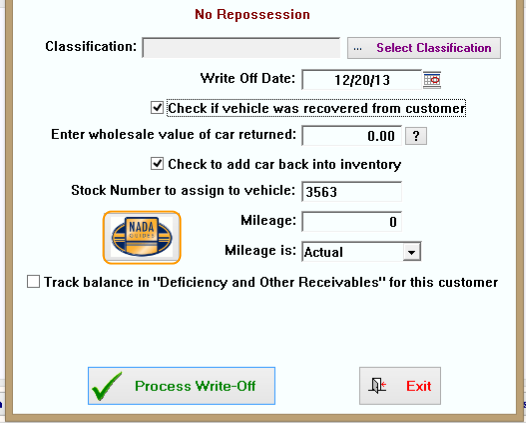 Beneath that , you can determine whether the mileage on your particular vehicle affects the value. You can decide whether or not you want to adjust the NADA values to accommodate this. You can also utilize the LTV calculator to adjust the appropriate value that your lender has based it’s loan decision on. These values include the retail value, loan value, Clean trade value, average trade value and rough trade value. Include next to each of these derived values are brief explanations of each, to see these click on the question mark to the right of each. Below these values is an auction value, if available. If you would like to print out the information listed here, click on the “Print” button at the bottom left of the screen. 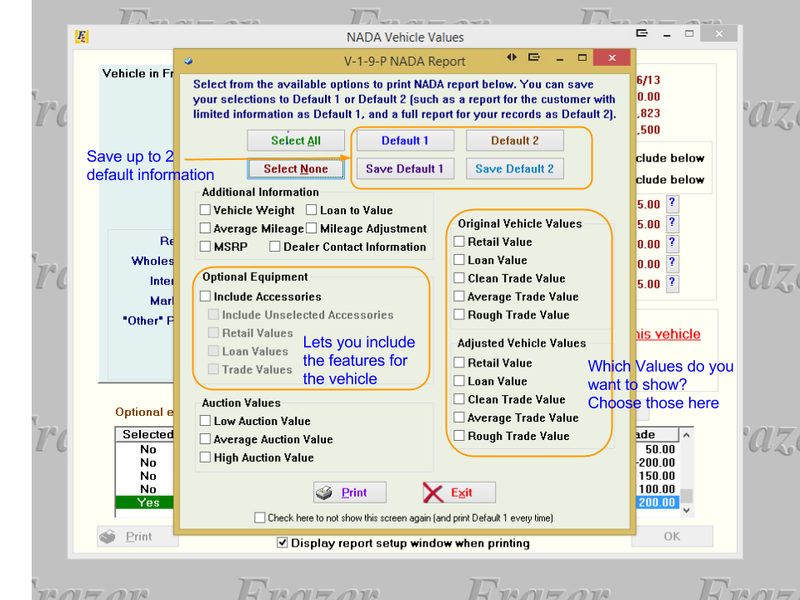 If the check box on the NADA screen is marked it will allow you to choose the information included on the book out sheet. 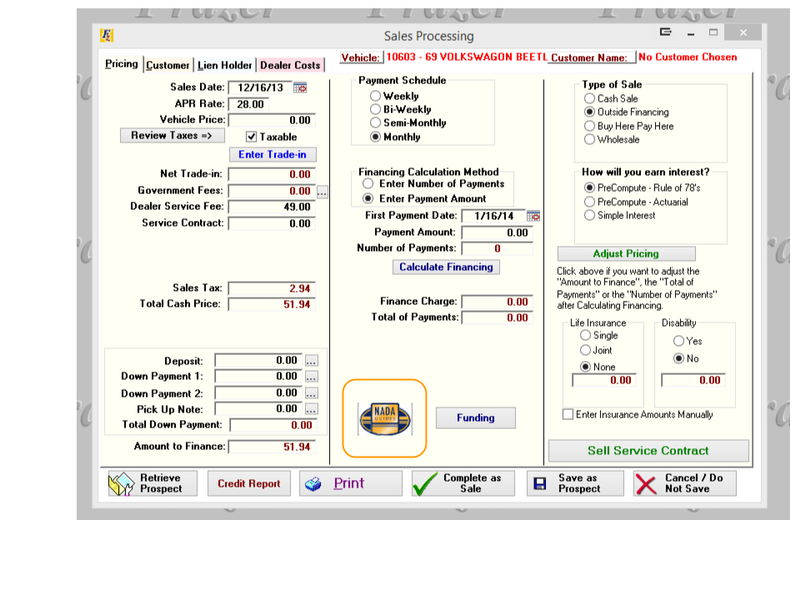 This screen is also available from other locations in your frazer including the sales processing screen. And by clicking on the vehicles tab and then click “9-Nada Value Guide”. Accessing the NADA guide through this screen will look a little different than the other methods. 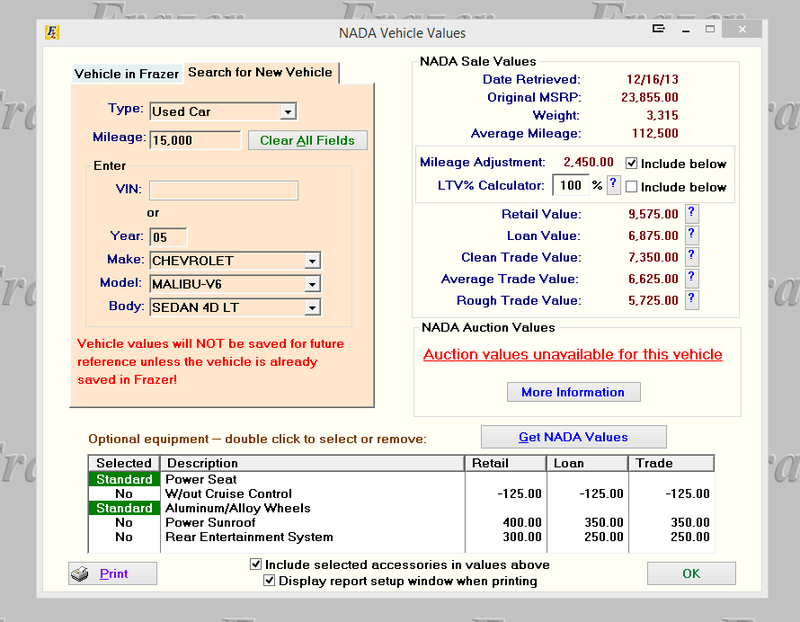 Through this screen you can not only look up the values for your existing inventory by clicking on the “Vehicle in Frazer” tab and selecting an existing inventory item. 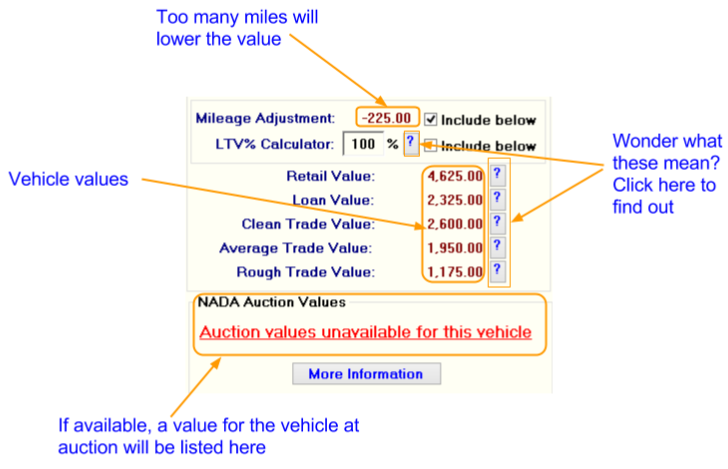 Or you can check the value of prospective inventory by manually entering the Mileage and the vin or the mileage and the year make model and body type of the vehicle. This will create a page similar to what you have seen before to help determine the value of prospective acquisitions.